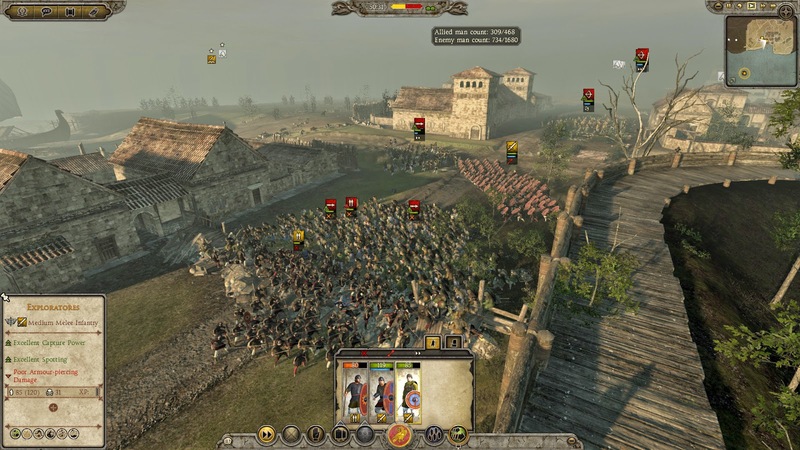 In this series, we spin the tale of the opening few turns of Total War: Attila’s grand campaign, from the Western Roman Empire’s perspective, playing on the normal difficulty. Surrounded by barbarians and nomadic hordes, the Empire’s borders are quickly painted a bloody crimson. The year is 395 AD. Having fed on the fat of past conquests, Rome, the jewel of the Empire has become corrupt and decadent. The Senates seats are filled by the amoral and the lax. Fresh-faced and brimming with ambition, can Emperor Flavius Honorius Augustus be the agent of change in what is sure to be dark and tumultuous times? 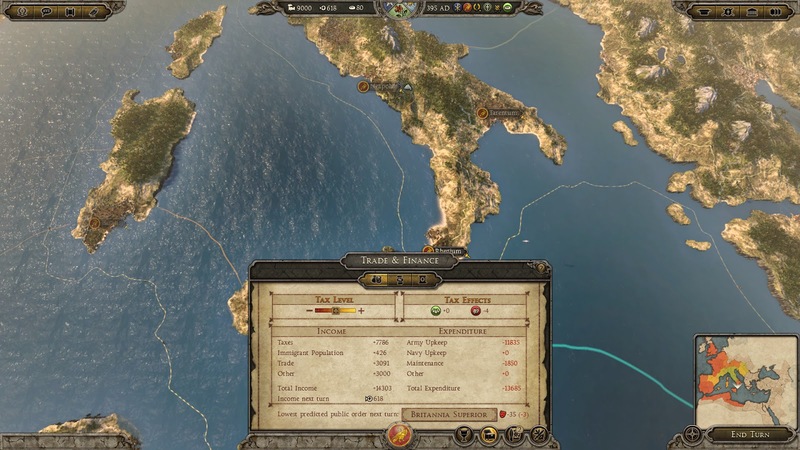 Currently, the Western Roman Empire is bringing in a measly 618 income per month. It barely covers the cost of the army and leaves little left over for growth. Naturally, I move next to reduce the size of the army, specifically to remove the ad-hoc combinations of Levis Armaturae (skirmishers) and Limitanei Borderguards (spearmen). 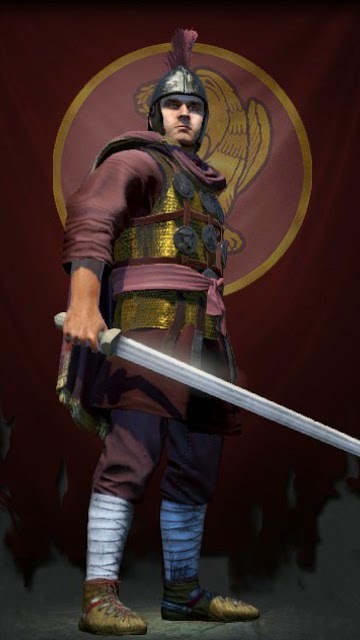 In classical Roman fashion, the reformed legions will have a solid core of heavy infantry; Cohors. Assisted by a sizeable complement of cavalry; Equites. Lo and behold, we are up to a predicted 5484 income next month. Finally, I exhaust the remaining Imperial coffers on a mixture of industrial and agricultural developments, and dish out some governorships (the first to Emperor Augustus himself of course…). 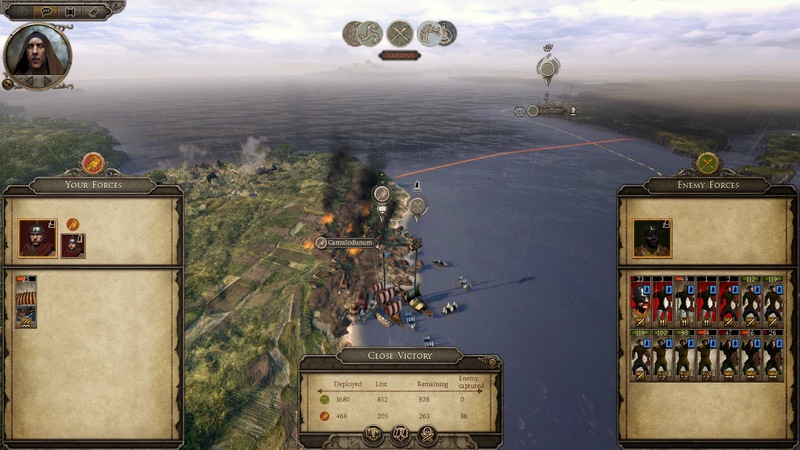 Almost immediately after hitting ‘End Turn’, foreign sails are spotted off the southern coast Britannia, and so, on the first turn of the campaign, the battle for Camulodumun begins. Saxon ships emerge from the veil of fog. 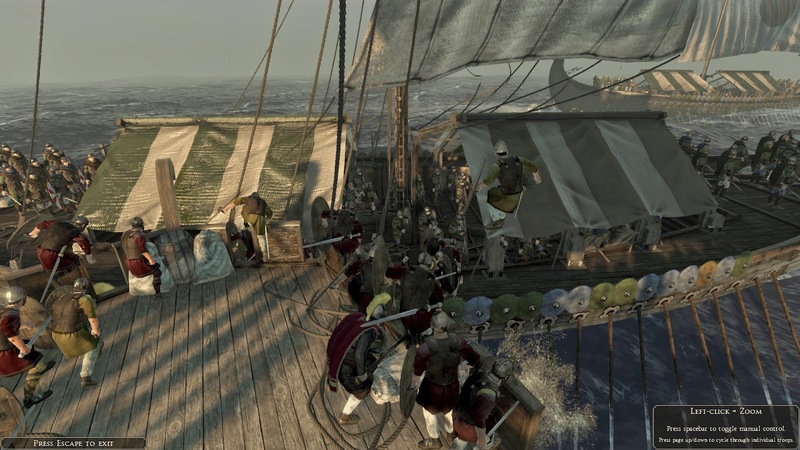 As I begin to deploy my forces, it becomes immediately clear just how dire the situation is; they are attacking the port settlement by sea and I have just one ship, while theirs seem countless. We are outnumbered four to one. With little hope of anything but a watery grave, I dispatched my lone ship towards the enemy fleet. Rather remarkably, my marines successful assault and board the enemy general’s vessel. His forces blinded by bloodlust and promised spoils, continue to row hard towards the Britannian beachfront, leaving him to be slaughter at sea. 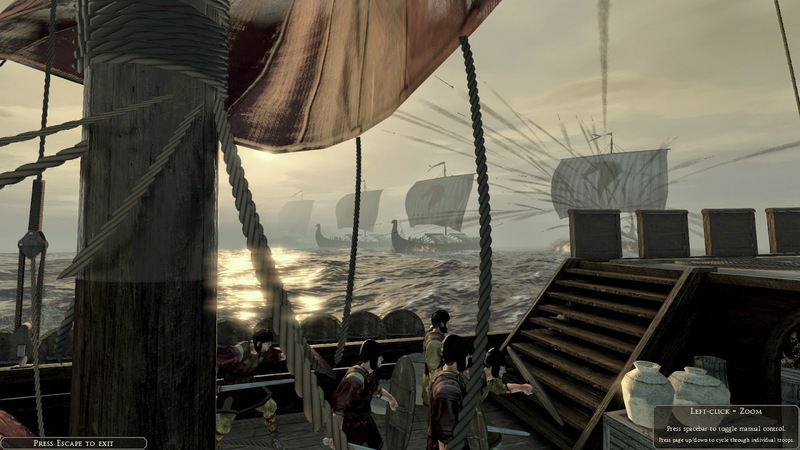 By the time the fleet reaches land, word of their generals absence spreads like wildfire through the Saxon ranks, hindering their ability to capture the port. Using the narrow streets of Camulodumun, and aided by prepared barricades, we trap the numerically superior Saxons, cutting them down in an almost text-book manner. A victory when outnumbered four to one is nothing to be sniffed at, a promising start to our reformation and defence of the Roman Empire. 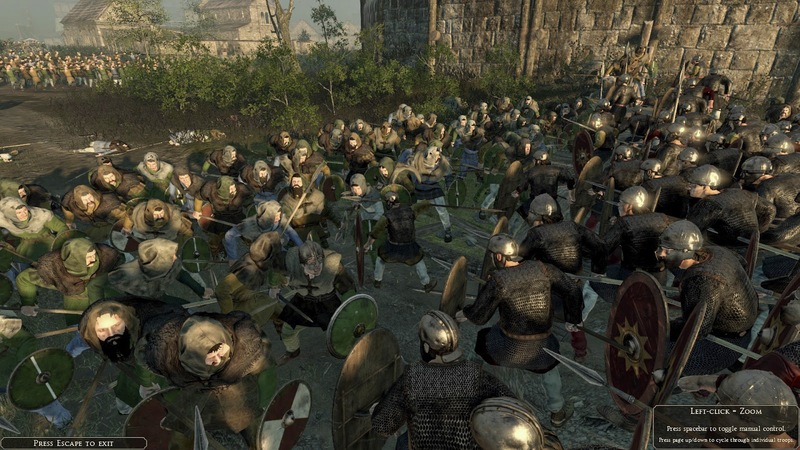 If you enjoyed reading this look into the opening hours of Total War: Attila, let us know, and check back for Part 2 soon!